I am delighted to share with you the recent report from our colleagues over at the Conference Board. 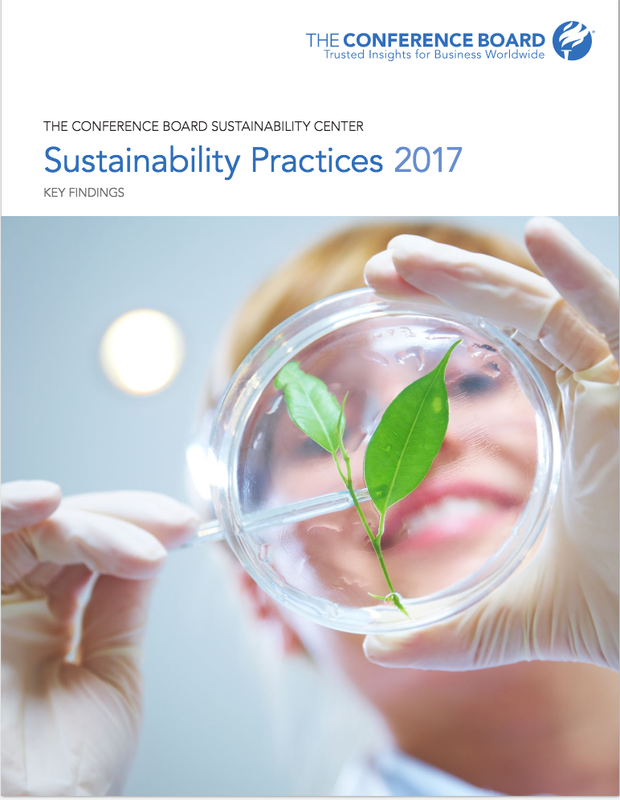 Their Report, Sustainability Practices 2017 (Dec. 2017), authored by Thomas Singer is worth a careful read. The initial insight is also very much worth keeping in mind: "Corporate sustainability reporting—the disclosure of environmental, social, and governance (ESG) practices—continues to transition from an exercise in transparency to a more targeted and strategic mechanism for companies to engage with stakeholders." (Ibid., p. 1). The six "Key Findings" from the Report follow along with my brief observations organized into six key points. The Sustainability Practices 2017 Report suggests both the scope and direction of movement as well as the challenges for companies in the context of the normative issues and reporting practices around sustainability. Key findings from the Report: (1) The practice of assuring sustainability reports is becoming more widespread, signaling the growing expectation from stakeholders for access to reliable, consistent, and high-quality nonfinancial data; (2) More than half of S&P Global 1200 companies have adopted a climate change strategy, yet only 16 percent are publicly disclosing the specific risks that climate change poses to their businesses; (3) Recognizing the key role incentive compensation can play in driving performance against sustainability targets, the number of companies linking executive compensation to ESG performance continues to increase; (4) Sustainability disclosure is not making much headway among S&P Global 1200 companies in the health care sector; (5) Compared to North American companies, European companies in the S&P Global 1200 are more than four times as likely to disclose the share of women holding management positions ; and (6) A larger share of charitable giving is becoming increasingly concentrated among a smaller subset of companies. There are a some observations perhaps worth making. First, it is clear that market tastes for sustainability reporting is increasing and that enterprises are now more willing to meet that demand. That process of generating demand and supplying product (in this case through markets for information provisions--GRI, etc.) reinforce and enhance the market ideology at the foundation of our contemporary system of globalization (here that statement is not meant as criticism, merely an observation about how systems continue to work efficiently). Second, the Report suggests the power of markets rather than planning driven change. The sector specific responses to sustainability reporting indicates that both demand for such reporting and the perception of a need to satisfy such demand (because of the demands of consumers, investors or other stakeholders deemed critical to performance (in whatever form performance is measured) follows markets. That provides a rather large market for civil society and other actors to change or manage market demand on a sector by sector basis. But it also suggests that civil society has not yet managed well that market--that is where is is substantial room for "improvement" in a sustainability driven culture for economic activity. Third, at the same time there appears to be substantial room for managing markets at the margin--the European focus on gender and gender reporting, for example, does help shape disclosure. At the same time the limitations of such disclosure regimes is evident. This is especially important in terms of rigidity and timeliness. Fourth, it is interesting to see how both corporate social responsibility and philanthropy have been subsumed within sustainability reporting. There is, indeed, a great contest for control of the narrative of CAR-sustainability that has not yet produced consensus. These revolve around the issue of the founding premises of institutional responsibility (both state and enterprise) for economic activity around three distinct principles, the founding principle of human rights, of sustainability and of shareholder welfare maximization through good works. Fifth, is the increasing role of compensation as a lever of incentive toward good sustainability practices. There is a contradiction and challenge here as well. While there is much talk about linking executive compensation to sustainability measures (and the difficulties in that context of standardizing methodologies and the like) there is virtually no talk about providing the same sort of rewards for sustainability practices throughout the enterprise. The contradiction is that such an approach sustains and hardens the hierarchy and top-down structures of sustainability that itself may make it much more difficult to embed sustainability cultures throughout the enterprise. Sustainability practices will not be naturalized until people begin to speak to issues of sustainability incentives as necessary from the "lowest" rung of the employee hierarchy to its highest levels. This is not a problem merely of "capitalism" but is inherent in the construction of hierarchy whatever the underlying political theory on which the state is operated. Sixth, it is heartening to see climate change now on the radar of sustainability reporting. That underlines the point that public policy with respect to sustainability is no longer exclusively a matter of public institutions, but indeed, that in markets driven systems of economic globalization, private actors have as much to say and as much influence on the construction and implementation of climate related practices as do states. To speak of climate change strategies as a matter of public policy limited to or driven solely by states is to misunderstand the realities of the transnational sphere and the power of enterprises on global production. And yet this Report suggests the potential as well as the challenges ot enterprise driven policy on climate change strategy.- Again another area where multi-stakeholder initiatives might prove useful, and a area in which market demand may drive enterprise behavior. Corporate sustainability reporting—the disclosure of environmental, social, and governance (ESG) practices—continues to transition from an exercise in transparency to a more targeted and strategic mechanism for companies to engage with stakeholders. Rather than broadening the scope of their disclosure, companies are increasingly urged to report on sustainability practices that are more relevant and material to their specific lines of business. This transition is resulting in higher-quality data that are enabling investors and other stakeholders to make better informed decisions about companies’ full range of risks and opportunities. For instance, this year’s key findings reveal that sustainability report assurance—the practice of using third-party verification for data in a company’s sustainability report—is now used by almost 40 percent of S&P Global 1200 companies. This represents a notable increase from the 2013 edition of this report, when only 25 percent of the same group of firms included assurance in their sustainability reports. The growth in sustainability report assurance follows the demand from stakeholders for high-quality, reliable, and consistent ESG data, and signals the continued evolution of sustainability reporting from a niche practice to one increasingly expected of companies. Companies in the studied sample are also lagging on the diversity side. Only 28 percent of S&P Global 1200 companies disclose the ratio of women to men in management positions, a figure that has dropped slightly compared to recent years. What is more, across the studied sample, the median percentage of women holding management positions has remained fairly flat over the last few years: less than 1 in 4 management positions are held by women. These are some of the findings from The Conference Board Sustainability Practices Dashboard 2017, a comprehensive database and online benchmarking tool that serves as the foundation for this report. The dashboard captures the most recent disclosure of environmental and social practices by large public companies around the world and segments them by market index, geography, sector, and revenue group. • The practice of assuring sustainability reports is becoming more widespread, signaling the growing expectation from stakeholders for access to reliable, consistent, and high-quality nonfinancial data. Almost two-fifths of S&P Global 1200 companies now include assurance of their sustainability reports, up 52 percent compared to three years ago. The increase is particularly notable among the examined companies in Latin America, where the use of GRI guidelines for sustainability reporting has also made strong headway. • More than half of S&P Global 1200 companies have adopted a climate change strategy, yet only 16 percent are publicly disclosing the specific risks that climate change poses to their businesses. The low levels of climate risk disclosure are driving increased shareholder activity on this topic, and companies can expect to face growing pressure from investors to improve disclosure of climate-related risks. • Recognizing the key role incentive compensation can play in driving performance against sustainability targets, the number of companies linking executive compensation to ESG performance continues to increase. Almost one-fifth of S&P Global 1200 companies now make this link, though the absence of standard methodologies and low levels of transparency mean there are wide variations in the application of this practice. • Sustainability disclosure is not making much headway among S&P Global 1200 companies in the health care sector. Health care was the sector with the biggest drop in average sustainability disclosure compared to last year, and the only sector to record a drop in average disclosure compared to 2013. This trend is consistent with the relatively low usage of GRI reporting guidelines among health care companies. One reason behind the low levels of disclosure is the relatively high mix of US companies within this sector, as these companies have historically been less exposed to international pressure to report on nonfinancial impacts. • Compared to North American companies, European companies in the S&P Global 1200 are more than four times as likely to disclose the share of women holding management positions. However, greater transparency is not necessarily improving companies’ performance on this metric: Women are represented in only about 1 in 5 management positions among European companies, a figure that has remained mostly flat over the past three years and a couple of percentage points below North American companies in the index. • A larger share of charitable giving is becoming increasingly concentrated among a smaller subset of companies. For example, the number of companies accounting for more than half of the reported contributions is about one-third what it was in 2013. This trend is the result of the combined effect of an increase in giving among the top 10 companies reporting charitable contributions and a decrease in median contributions across the full sample.